Sharp Plasmacluster Air Purifiers - 10 Reason to Buy. Sharp's Plasmacluster® Ion (PCI) Patented active air cleaning technology is a technological breakthrough in air purification that goes beyond the conventional air purification systems. This unique technology replicates Nature's Own air cleaning process that purifies air in the Earth's atmosphere. It works by producing the balanced shower of positive and negative ions from water vapors in the air. The ions are dispersed throughout the entire room where they actively seek, attack and deactivate airborne pathogens: germs, bacteria, viruses, mold spores, fungi, etc. Since the ions work on the molecular level, they are very effective in destroying harmful chemical substances and reducing odors such as: cigarette smoke, cooking odors, per odors, cleansers, perfumes, etc. The ability of ions to penetrate the fabric makes them highly effective in destroying pathogens and odor producing chemicals even the ones embedded into carpeting, drapery, furniture, upholstery, clothing, etc. The Plasmacluster Ion technology should not be confused with the conventional Ionizers used in some other models of air purifiers on the market. Unlike conventional Ionizers that produce Ozone as a by-product, the Plasmacluster Ion Generators Do Not Produce Ozone. The natural emission of ozone from Sharp Air Purifiers as electric devices, is Less than 0.01 ppm (particles per million). This is Five Times Lower(!) than the Consumer Electronics Safety Industry Standard of 0.05 ppm. This makes Sharp Plasmacluster Ion Air Purifiers totally safe for use even by chemically sensitive individuals. The experiments conducted by testing institute in Japan demonstrate that Plasmacluster Ion technology has the ability and power to reduce mold fungus by 90% in one hour. Another test results showed that 99.7% of the viruses exposed to the ions die within 40 minutes. The Plasmacluster (PCI) Technology is patented in over 40 countries worldwide and is Exclusive to Sharp Products! The proven effectiveness of Plasmacluster® ions to significantly reduce the level of airborne pathogens and chemical substances in the air is now widely used by leading automotive companies to freshen the air inside cars, and in refrigerators to maintain freshness of food and kill mold. The total number of devices using the Sharp's Plasmacluster Ion technology exceeds 20 million worldwide and growing. Sharp air purifiers combine 2-in-1 and even 3-in-1 devices which are essential for maintaining the healthy and comfortable indoor environment. 1. High quality conventional air filtration system consists of 99.97% efficiency True HEPA filter and washable reusable activated carbon filter. 2. 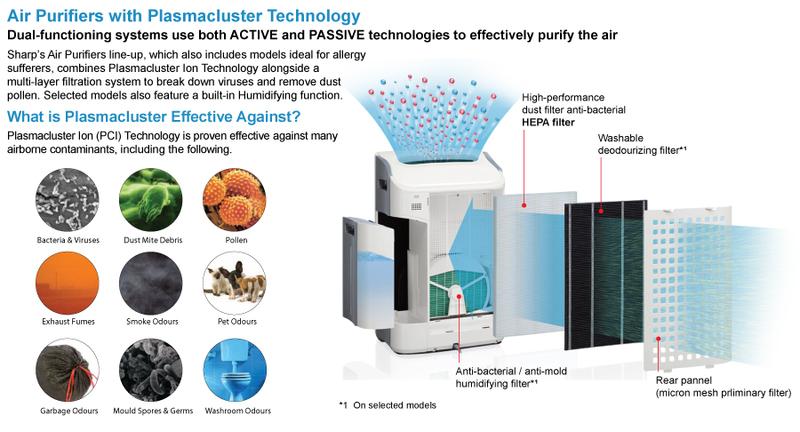 Plasmacluster Ion active germs and chemical reducing air purification technology. 3. The humidifying function helps maintain the comfortable humidity level to bring the soothing relief from dry air. All two or three air treatment technologies are seamlessly combined in one Sharp unit. This cost effective feature is especially important when it comes to saving space. The intelligent controls along with dust, temperature and humidity sensors allow them to work in a perfect harmony while maintaining the maximum comfort in your home automatically. To ensure that all harmful irritants are take out of the air you breathe, all Sharp air purifiers are equipped with genuine True HEPA filter. It has a guaranteed filtration efficiency of over 99.97% in trapping all solid airborne contaminants from the passing through air as small as 0.3 micron in size. This includes all airborne contaminants and allergens such as: lung damaging dist, mold and plant spores, pet dander, bird feather dust, fine ash particles in cigarette smoke, dust mites and debris, etc. Long-life true HEPA filter in Sharp air purifiers typically lasts for 2 to 5 years. The separate activated carbon filter in Sharp air purifiers effectively adsorbs most chemical substances found in residential and office indoor environment, including cigarette smoke, cuisine odors, pet odors, all other noxious odors, household chemicals, etc.. The activated carbon filter can be washed and reused to extend its lifetime and save on the replacement filter's cost. Working together with Plasmacluster ion generator, both filters ensure fast and effective air cleaning result. Sharp air purifiers are equipped with Intelligent controls and a multi-functional LED display to automatically Detect, Display and React on any changes in air quality. The built-in temperature, dust and humidity sensors monitor the air quality in a room. When floating dust or other airborne pollutants are detected, the air purifier will change the operating speed from Low to Medium or High to quickly capture the unwanted air pollutants. When low humidity is detected (below 40%), the air purifier equipped with humidifying function, will adjust the operating speed to put more moisture into the air to maintain the comfortable humidity level between 40% and 60%. Once the the air quality is improved, the unit turns back to Low speed to save energy. So you can sit back and enjoy healthier, fresher air. While doing this, Sharp air purifiers displays the condition of the air and the changes in the operating mode on multi-functional colorful LED display. 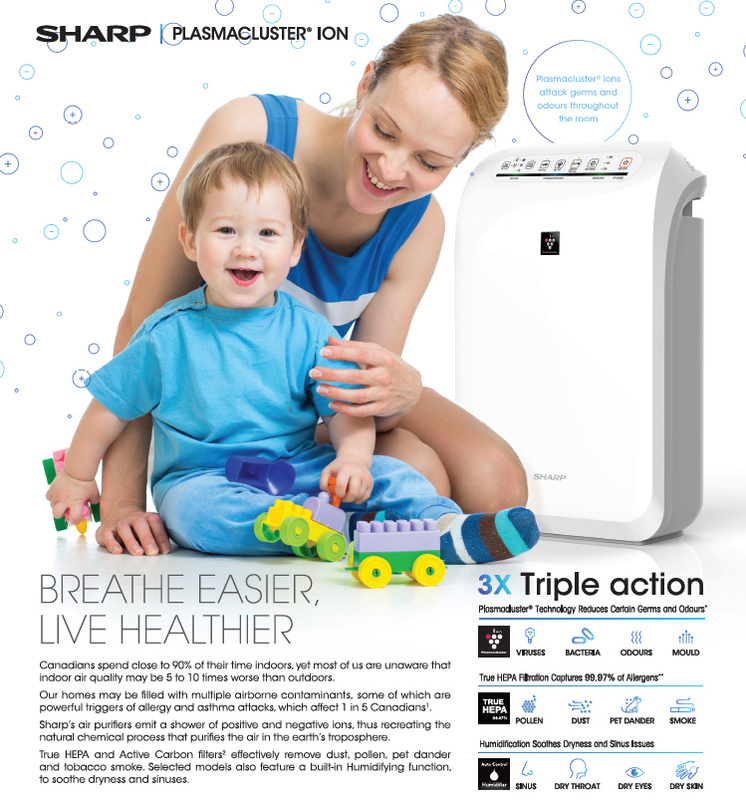 Sharp Air Purifiers employ large Long-lasting True HEPA filters and Washable reusable Activated Carbon Filters. Under normal use and care in normal residential conditions both True HEPA and Activated Carbon Filters do not require replacement for 2 to 5 Years! Sharp air purifiers are Ultra Low Energy consumption air purifiers and ENERGY STAR® rated units. In most models the power consumption on "Low" setting is a mere 3 to 5 Watts and doesn't exceed 54 Watts on "High" settings. This is few times lower than the power consumption of similar size air purifiers on the market. At the same time the Plasmacluster Ion generating device requires less than 0.5 Watts of power(!) to operate. All this brings the electricity operating cost of Sharp Air Purifiers down to less that a Pennies a day. By combining 2-in-1 and 3-in-1 devices Sharp air purifiers are cost saving units. Sharp's exclusive air filtration system along with the high quality noise and vibration-free motor-fan assembly makes Sharp air purifiers whisper in operation at a record-low level of 19 dB (on "Low" for KC-850U, KC-860U models). This makes Sharp air purifiers truly a Library Quiet™ units that seamlessly blend in with your everyday life and allow for a peaceful quiet night's sleep. Sharp Air Purifiers Do Not Produce any Toxic Off-Gassing. All components of Sharp Air Purifiers are made of high quality non off-gassing materials that produce no toxic off-gassing. Sharp Air Purifiers Produce No Ozone. Unlike conventional Ionizers used in many other air purifiers, that produce ozone as a by-product, the natural emission of ozone from Plasmacluster Ion generators used in Sharp air purifier is Less than 0.01 ppm (particles per million). This is Five Times Lower (!) than the Consumer Electronics Safety Industry Standard of 0.05 ppm. This makes Sharp air purifiers the environmentally clean and safe devices. Sharp air purifiers are ENERGY STAR® rated devices. The Ultra low energy consumption - a mere 3 to 5 Watts on "Low" setting brings the operating electricity cost down to only Pennies a day. So you don't have to worry about leaving the air purifier On 24x7 and let it do the job of cleaning the air you breathe. The Intelligent controls adjust the operating speed of the air purifier according to the room air quality and reduce the power consumption even further. With over 60 patents pending and numerous international awards, Sharp air purifiers are the World's Most Awarded air purifiers. Sharp is a recipient of prestigious "Takagi Award" in Japan. This Award is given for Breakthroughs in Science and Technology. For the First Time the "Takagi Award" was awarded to a consumer products company - Sharp. The Sharp Air Purifier system has been awarded the British Allergy Foundation Seal of Approval. Since their introduction in 2003, Sharp Air Purifiers quickly became the # 1 Selling Air Purifier Brand in Japan, South Korea, China. The unique features of Sharp Air Purifiers are widely recognized by the medical communities in the USA, Canada and Europe where their popularity is growing at a fast pace. Sharp Air Purifiers - Environmentally Friendly "Green" Air purifiers. The Sharp air purifier properties such as, Ultra low energy consumption, very quiet operation, absence of toxic off-gassing, almost non-existent emission of ozone, the long-life filters etc. help reduce the impact on the environment. This makes Sharp air purifiers the environmentally friendly and a truly "Green" units.